This concise, affordable, and engaging text is designed for introductory courses on logic and critical thinking. This unique book covers the basic principles of informal logic while also raising substantive issues in other areas of philosophy: epistemology, ethics, philosophy of language, and philosophy of science. The author's presentation strikes a careful balance: it offers clear, jargon-free writing while preserving rigor. Brimming with numerous pedagogical features this accessible text assists students with analysis, reconstruction, and evaluation of arguments and helps them become independent, analytical thinkers. Introductory students are exposed to the basic principles of reasoning while also having their appetites whetted for future courses in philosophy. Gary Seay has taught formal and informal logic since 1979 at the City University of New York, where he is presently professor of philosophy at Medgar Evers College. His articles on moral philosophy and bioethics have appeared in The American Philosophical Quarterly, The Journal of Value Inquiry, The Journal of Medicine and Philosophy, and The Cambridge Quarterly of Healthcare Ethics, among other journals. With Susana Nuccetelli, he is editor of Themes from G. E. Moore: New Essays in Epistemology and Ethics (Oxford University Press, 2007), Philosophy of Language: The Central Topics (Rowman & Littlefield, 2007), and Latin American Philosophy: An Introduction With Readings (Prentice Hall, 2004). Gary Seay may be contacted at garys@mec.cuny.edu . For more information about his work, visit http://www.mec.cuny.edu/academic_affairs/libarts_ed_school/phil_rel_dept/seay_bio.asp. Susana Nuccetelli is professor of philosophy at St. Cloud State University in Minnesota. Her essays in epistemology and philosophy of language have appeared in Analysis, The American Philosophical Quarterly, Metaphilosophy, The Philosophical Forum, Inquiry, and The Southern Journal of Philosophy, among other journals. She is editor of New Essays in Semantic Externalism and Self-Knowledge (MIT Press, 2003) and author of Latin American Thought: Philosophical Problems and Arguments (Westview Press, 2002). She is co-editor of The Blackwell Companion to Latin American Philosophy (Blackwell, 2009) and, with Gary Seay, Ethical Naturalism: Current Debates (Cambridge University Press, forthcoming, 2011). Susana Nuccetelli may be contacted at snuccetelli@stcloudstate.edu . For more information about her work, visit http://web.stcloudstate.edu/sinuccetelli/. 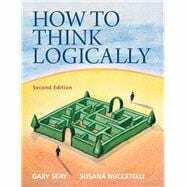 Now in a new Second Edition, How to Think Logically is a concise and user-friendly textbook for freshman-level logic and critical thinking courses. Focused throughout on arguments and how we may evaluate them, the book is intended to show students how to distinguish between arguments that ought to persuade us and those that should not. It presents students with criteria for assessing both deductive and inductive reasoning, and it does so in a clear writing style much praised by our students. "This book is well written and structured," students have told us again and again over the ten semesters since it first appeared. "It’s easy to understand." We believe that critical thinking skills are more vital than ever as a component of a liberal education. In a world where college graduates face increasingly fierce competition for jobs, those who are careful reasoners, lucid writers, and clear-headed thinkers are simply better equipped to succeed in any area of specialization. Learning these skills, however, should not be a dry, dull process, but an exercise leavened with humor and down-to-earth examples that students can understand. How to Think Logically accomplishes these goals with materials designed specifically for readers who have never encountered philosophy before, and for whom analytical thinking may at first be an unfamiliar exercise. In our courses at the City University of New York, at St. Cloud State University in Minnesota, and at the University of Texas Pan American, we have used this book with students from a great number of different nationalities, ethnicities, and economic backgrounds. Invariably, we find that students respond well to its simple format, lively examples, and plain language. In addition, this textbook comprises only enough material for a standard fifteen-week course (with flexibility to allow instructors options for different approaches); thus students are not paying for material they don’t use. This helps us keep costs down, a welcome feature at a time when students are struggling with soaring tuition and fees! But at no point does How to Think Logically compromise on logical rigor. The book charts a mainstream course through discussions of natural language, meaning, truth, belief, and definition. It discusses twenty of the most common informal fallacies, explaining what is wrong with each type and how to avoid it. It also includes an expanded treatment of deductive reasoning, both in modern, propositional logic (including the rudiments of symbolic notation and natural deduction) and traditional, syllogistic logic. We believe that this is the book instructors have been looking for. It presents a broad and immensely readable approach to introductory-level logic, yet it does so concisely and at moderate cost. We are interested in hearing from instructors who adopt our book, since we do value their suggestions for improving it. We want to know what works best in the classroom. So please do email us if you have suggestions or criticisms at garys@mec.cuny.edu and sinuccetelli@stcloudstate.edu. We look forward to learning about your experiences with How to Think Logically. Chapter One What Is Logical Thinking? And Why Should We Care? 7.1 What Is a Fallacy? 10.8 Is the Appeal to Emotion Always Fallacious? 13.1 What Is a Categorical Proposition? 14.1 What Is a Categorical Syllogism?